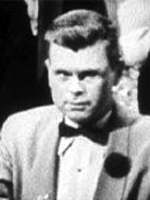 Barry Nelson was the very first actor to portray James Bond. Barry Nelson (April 16, 1917 – April 7, 2007) was an American actor, noted as the first actor to portray Ian Fleming's secret agent James Bond Nelson made his screen debut in the role as Paul Clark in Shadow of the Thin Man (1941). He went on to appear on Broadway in the original Broadway production of The Moon is Blue; During the play's run, he also starred in a CBS half-hour drama called The Hunter, premiering in July 1952. He played Bart Adams, a wealthy young American whose business activities involved him in a series of adventures. He also appeared in the Abe Burrows comedy Cactus Flower in 1965 and in The Fig Leaves Are Falling in 1969. Another Broadway role, that of Gus Hammer in The Rat Race (1949), kept Nelson away from the movies again, but after it closed he starred in the dual roles as Chick Graham and Bert Rand in The Man with My Face (1951), which was produced by Ed Gardner of radio fame. He was the first actor to play James Bond on screen, in a 1954 adaptation of Ian Fleming's novel Casino Royale on the television anthology series Climax! (preceding Sean Connery's interpretation in Dr. No by eight years) Nelson appeared in "Threat of Evil", a 1960 episode of CBS's anthology series The DuPont Show. His additional television credits include guest appearances on Alfred Hitchcock Presents, Ben Casey, The Twilight Zone (episode "Stopover In A Quiet Town"), Dr. Kildare, and later years played a hobo on an episode of The Ropers. He appeared regularly on television in the 1960s, having been one of the What's My Line? mystery guests and later serving as a guest panelist on that popular CBS quiz show. Nelson appeared in both the stage and screen versions of Mary, Mary. The Suicide Club is one my fav.